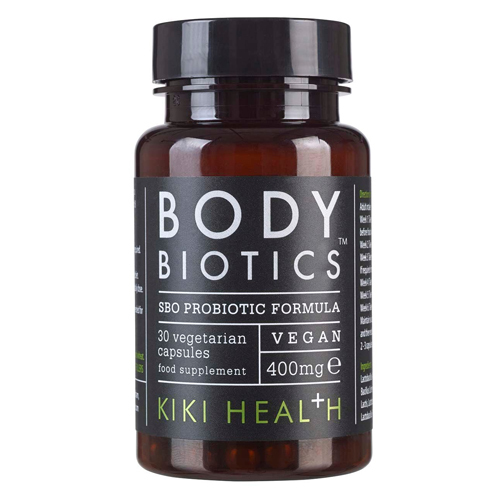 KIKI Health Body Biotics - SBO Probiotic Formula addresses the need for prebiotics in their formula by using a proprietary blend of humic & fulvic acids to culture a symbiotic blend of 8 highly effective, soil based friendly bacteria super-strains. Week 1: Take one capsule a day, 30 minutes before food with juice or pure water. Week 2: Take one capsule twice a day. Week 3: Take one capsule three times a day. Week 4: Take four capsules a day. Week 5: Take five capsules a day. Week 6: Take six capsules a day. Maintain 6 capsules a day for 6 months or longer, and then reduce to an average of 2-3 capsules. Do not take capsules with hot beverages. Not recommended for pregnant or lactating mothers. 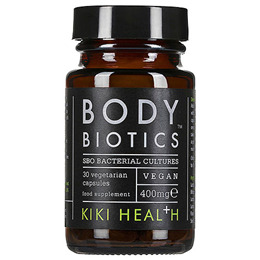 Below are reviews of KIKI Health Body Biotics - 30 x 400mg Vegicaps by bodykind customers. If you have tried this product we'd love to hear what you think so please leave a review. Kiki products are working for me. I have been using the probiotics for a while now and am even happier now that they're available in 120 amount. Easier to order now - great and highly recommended. This is the second time I have ordered and used this companies Body Biotics. Many factors are to be considered before taking pro or pre Biotics. I have found this product to be gentle as well as effective. Good product, good combination of essential microorganisms. I buy it for both me and my dog, it keeps her intestines performing properly. Excellent product. Unlike all the other probiotics out there it actually works. It is the only product that helped my insides recover from a million in tolerances and healed them, whilst killing all the candida. I couldn't eat anything, now I can eat everything. The main thing is that it provides microorganisms in a symbiotic environment so that they can be assimilated together, like it used to be in the top-soil before our farming destroyed it. So organisms that colonise the small intestine for example can be taken together with ones that colonise the large one, and survive the journey down the digestive track.